Strategically located in the center of southern Brazil, Uberlandia has developed an economy largely based on inter-city trade. On the 18th (Mon), take in the dramatic scenery at Cachoeira das Irmas and then take in the dramatic scenery at Cachoeira do Corrego Bom Jardim. On the 19th (Tue), you'll have a packed day of sightseeing: take in the spiritual surroundings of Igreja Batista do Evangelho Pleno, then stop by Uberlandia Shopping, and then let little ones run wild at Parque do Sabia. For photos, traveler tips, reviews, and tourist information, you can read our Uberlandia trip planner . The Route module shows you travel options from your home to Uberlandia. In March, plan for daily highs up to 31°C, and evening lows to 22°C. Finish your sightseeing early on the 19th (Tue) to allow enough time to travel to Salvador. Relax by the water at Praia Farol da Barra and Guarajuba Beach. Get in touch with nature at Praia do Porto da Barra and Flamengo Beach. 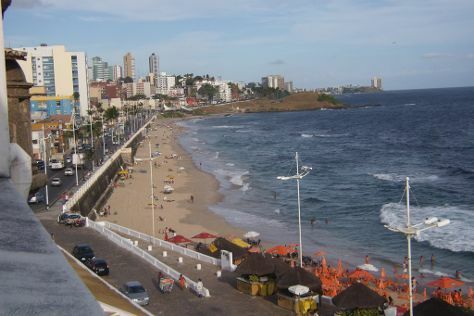 Step out of Salvador to go to Lauro de Freitas and see Vilas do Atlantico Beach, which is approximately 44 minutes away. There's lots more to do: take a stroll through Pelourinho, hunt for treasures at Mercado Modelo, pause for some photo ops at Elevator Lacerda, and examine the collection at Santo Antonio da Barra Fort and Nautic Museum of Bahia. To find ratings, more things to do, reviews, and more tourist information, use the Salvador trip app . Getting from Uberlandia to Salvador by flight takes about 6.5 hours. Other options: do a combination of bus and flight; or drive. Expect a bit warmer temperatures when traveling from Uberlandia in March; daily highs in Salvador reach 36°C and lows reach 29°C. Wrap up your sightseeing on the 24th (Sun) to allow time to travel back home.